Now available from the Lithic Artists Guild for $20.00 plus shipping. The Lithic Artists Guild was founded by myself in the summer of 2004. The main goal of the Lithic Artists Guild has been to promote Modern Lithic Art as a legitimate art form. The Guild has helped to greatly expand today's collector's market as well as significantly increase the value of today's best art work. After operating in Manito, Illinois for one year I decided to move the Guild's business operation to the Pella, Iowa area in the Spring of 2006. A new building was built to provide the necessary room for growth and expansion. On September 1, 2009 the Guild will celebrate its fifth anniversary. As part of that celebration the Guild will induct 15 artists and 15 collectors in the Guild's Hall of Game. All Hall of Fame members have been strong supporters of the Guild as well as the flint knapping community. 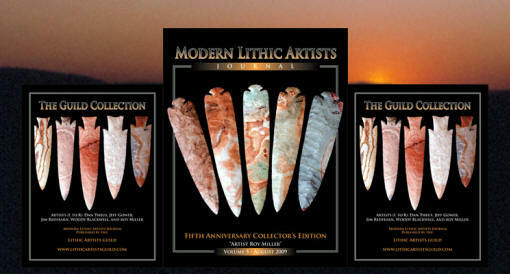 Additionally, the Guild has introduced the Masterpieces of Modern Lithic Art Gallery as part of our official web site. Our Goal is to be "Simply the Best" web site sales gallery for top end works of Modern Lithic Art. When you log onto www.lithicartistsguild.com you will see some of the finest modern arrowheads in the country being offered for sale today. "September 1, 2009 commemorates the fifth anniversary of the Lithic Artists Guild. I originally organized the Guild to promote Modern Lithic Art as a legitimate art form." ---2009, Tom Onken, "Modern Lithic Artists Journal." "My collection of modern points is at my (dentist) office where I enjoy them everyday, and I am constantly showing them to my patients." ---2009, Leslie Pfeiffer, "Modern Lithic Artists Journal," p. 1. "After investigating where some of these fine modern pieces were coming from in the wrong marketplace and getting to know some of the better knappers in the process I have become converted to a different way of collecting called "Modern Lithic Art." ---2009, Rodney Chapman, "Modern Lithic Artists Journal," p. 1. "To watch a knapper pursue a point from only a pebble or take on a large chunk of stone using another stone, wood, antler, or copper tool---their creations never cease to astonish." ---2009, Carolyn Johnson, "Modern Lithic Artists Journal," p. 2. "Without question the Guild has made me a better knapper! It has also and most importantly taken modern lithic art to a new collectable level!" ---2009, Ed Moreland, "Modern Lithic Artists Journal," p. 2. The Lithic Artists Guild is a recent and new phenomenon that has established itself in just a few short years. People are beginning to collect modern lithic art more now than ever before. The word is getting out through the "Modern Lithic Artists Journal." This is the only publication that illustrates in color all the latest and finest examples of modern lithic art. These points are not broken and glued together! They are made from single pieces of Obsidian. Steve calls them San Andreas Fault points. 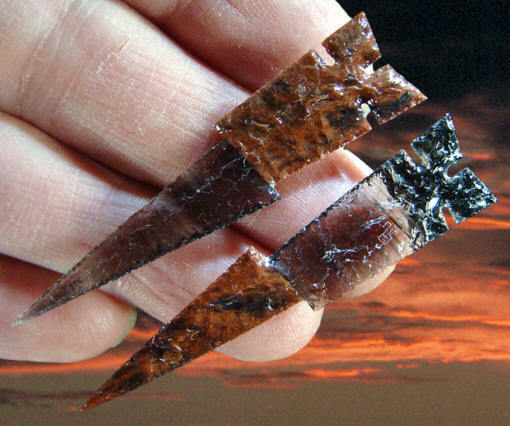 They are made from uniquely colored pieces of Obsidian which gives the illusion of broken points that are glued together. These points are the result of very skillful knapping and artistic innovation. 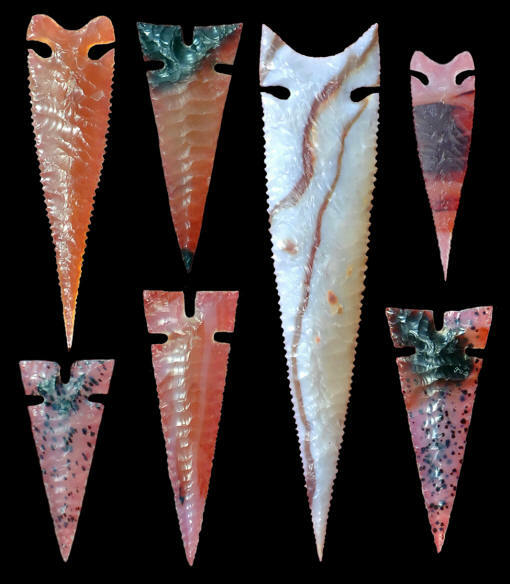 They are wonderful examples of a fresh and new type of lithic art. Steve Allely has been knapping for 40 years. He is best known for his world class Columbia River gem points. Steve Allely is known for his exquisitely crafted arrow points. This picture illustrates some of his work. All are very thin and delicate. The fourth point from the left is one of his San Andreas fault points---it really is made from one piece of stone and is not glued together! Also, for anyone who wants to collect modern lithic art, be sure and go to the Lithic Artists Guild web site to see some of the beautiful pieces that are available for sale. You can contact Tom Onken for prices or to let him know what type of lithic art you are interested in. 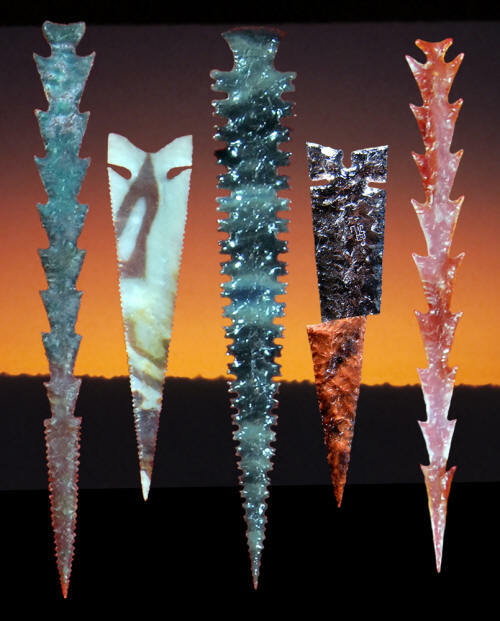 These five Clovis points were made by Woody Blackwell and are now in the Leslie Pfeiffer collection. They are made of Alibates and Tecovas Jasper. 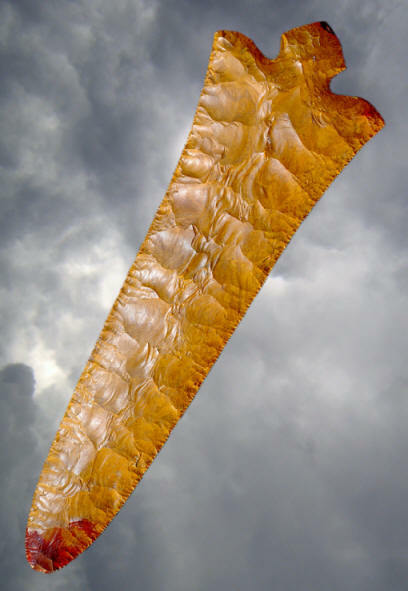 The largest point measures 6 1/2 inches (16.5 cm) long. Woody Blackwell has been knapping for over 19 years. He is considered by many collectors to be one of the best knappers living today. His Ross points are his signature points. Very few ancient artifacts can compare to the fine craftsmanship exhibited by today's best knappers. Modern knappers are still producing many of the most recognizable point types copied from ancient cultures. But they are also producing a fascinating array of innovative and unique art pieces. Woody Blackwell is know for his beautifully made Ross blades. This is another fine example of his work. It's made of Georgia Jasper and it measures 12 inches (30.4 cm) long. Every year now, lithic artists are producing new and innovative art that has never been seen before. There seems to be no limit to the different forms. As an example, Steve Alley has recently made what he calls San Andreas Fault points. He made them from pieces of Obsidian that are translucent on one end and opaque on the other and meet in a straight line. The design of the point takes advantage of the area where the two colors meet. The point is flaked to look as though it's two different points that have been glued together. His points are illustrated in this article. The four triple-notched Cahokia style points in this picture were made by Jim Hopper. Jim Hopper is famous for his flake-over-grinding technique of pressure flaking. Tom Onken says, "No one is any better at pressure flaking with a mule deer antler tine than Jim." Jim Hopper has been flintknapping for over 50 years. The other three points in this picture were made by Steve Allely. The long white point measures 4 1/2 inches (11.4 cm) long. Another form of lithic art has been produced by Woody Blackwell. These might be described more as sculptures. They incorporate additional materials such as wood, iron and twine to achieve the desired art model. One sculpture involves a well made biface that is suspended high above a large number of percussion flakes that cascade down and spread outward on the base below. Another example is a hand made from red glass that is suspended in a net between a wooden frame. 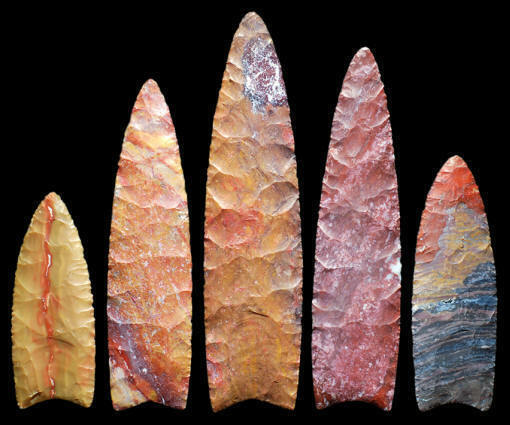 2004, Whittaker, John C., "American Flintknappers," pp. 34-37. 2009, Onken, Tom, "Modern Lithic Artists Journal," Volume 5. 2009, Personal Contact, Tom Onken.